Iowa GOP straw poll is dead: Why Hawkeye State Republicans cancelled one of their biggest fundraisers. 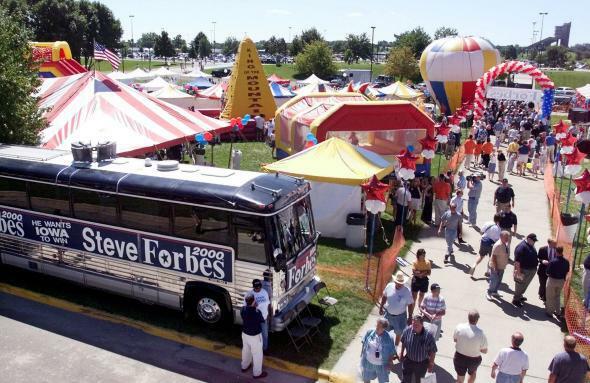 The carnival-like scene at the 1999 straw poll, where Steve Forbes and other candidates spent big on an event that was good for some free press, but not much else. The Iowa Straw Poll is no more. The Des Moines Register reports that the Republican Party of Iowa’s governing board voted unanimously on Friday to cancel the pre-election year event, which had served as an early—if not exactly reliable—test of strength for GOP presidential hopefuls for more than three decades. “I’ve said since December that we would only hold a straw poll if the candidates wanted one, and this year that is just not the case,” state GOP Chairman Jeff Kaufmann said in a statement. While the party doesn’t appear to have ruled out reviving the poll in future elections, Friday’s decision effectively ends its run as a marquee event on the nominating calendar. The contest, which was first held in 1979, had turned increasingly expensive for GOP hopefuls. In recent campaign cycles, candidates spent tens of thousands of dollars to bus in supporters and lock down prime space for their tents at the daylong event. As I explained last month, it wasn’t often money well spent: Winning the straw poll was good for some free press, but guaranteed little else. Only half of the candidates who won the straw poll went on to win the Iowa GOP caucus the following year, and only two—Bob Dole in 1995 and George W. Bush in 1999—went on to win their party’s nomination. In 2011, Michele Bachmann won the poll. Mitt Romney, meanwhile, skipped the event but still went on to finish a close second in the GOP caucus on his way to locking down his party’s nomination. In hopes of saving their event, Iowa Republicans had announced plans to scale back this year, but those efforts failed to win over most of the Republican field. Jeb Bush, Marco Rubio, and Mike Huckabee had all previously said they would pass on the event, and the rest of the field was largely non-committal. Huckabee’s decision probably sealed the straw poll’s fate, given that his surprise second-place finish in 2007 set the stage for his even more surprising victory in the Iowa caucus the following year. Without the GOP’s big names dropping big dollars to win the non-binding poll, the fundraising event ran the risk of actually losing money this year. Also driving the decision, at least in part, were Iowa Republicans’ (constant) fears that carrying on with the status quo could have endangered their caucus’ status as the first nominating contest in the country. GOP officials from other states have long complained that Iowans got two bites at the field-winnowing apple, first at the straw poll and then during the caucus. Previously in Slate: Iowans Always Complain The Caucuses Are Getting Less Important. This Time They Have a Point.